The new ADO Collection for Spring / Summer 2016 is named after a Beach Boys song. 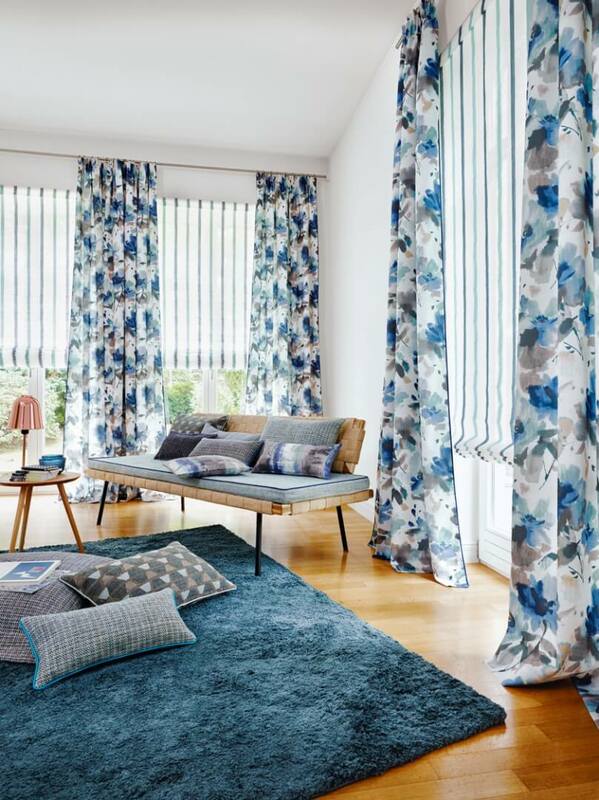 And this was no accident – just like the song, ADO’s interior fabrics also instantly ooze positivity and create good vibrations in your home, so they are bound to top the charts. Another similarity is that the song was one of the first to use the ‘sound collage’ method. ADO’s head designer, Stefan Gabel, took inspiration from this mix-and-match approach. The fabric compositions he has created are real show-stoppers, as solo pieces or harmonizing with one another. To best enjoy these ‘Good Vibrations’ textiles, you should see them live! 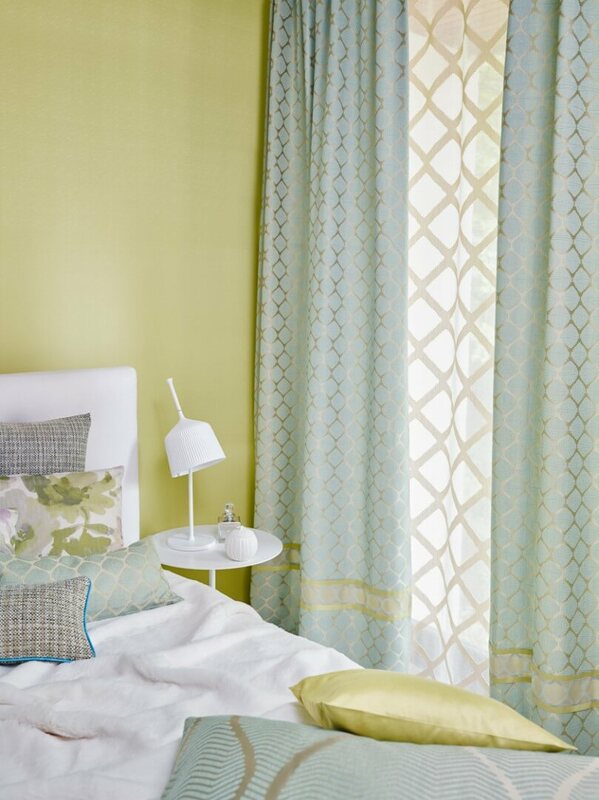 These fabrics are as light and airy as a spring morning. 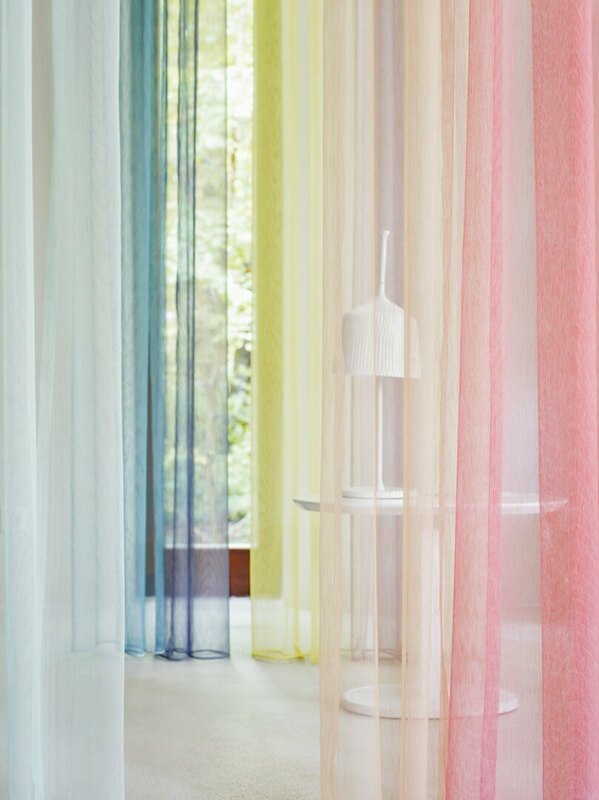 Clear patterns in strong colors give these high-quality transparent fabrics a modern feel. 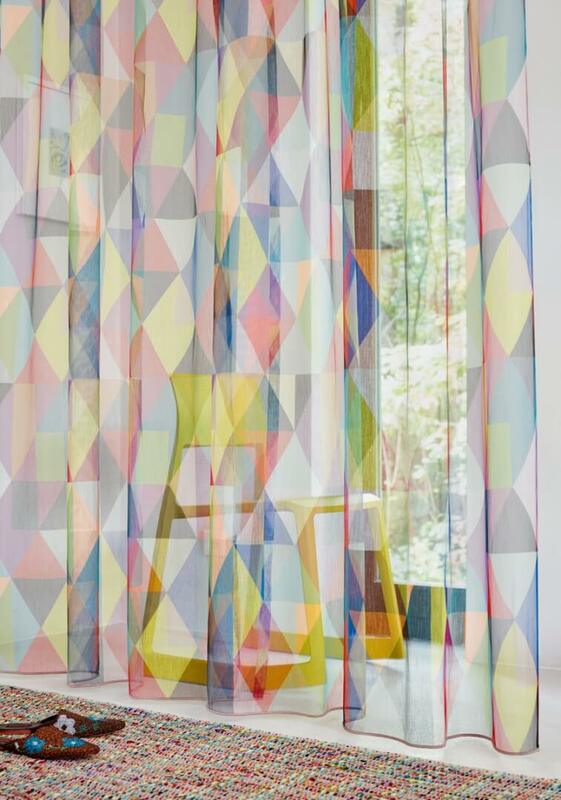 An eye-catching, colorful design on an ultra lightweight, flame-retardant Trevira CS transparent fabric that gives the impression of looking through a delicate kaleidoscope. This prism-based design is available in three fresh color combinations, from soft pastel shades through to vibrant multi-colored tones. 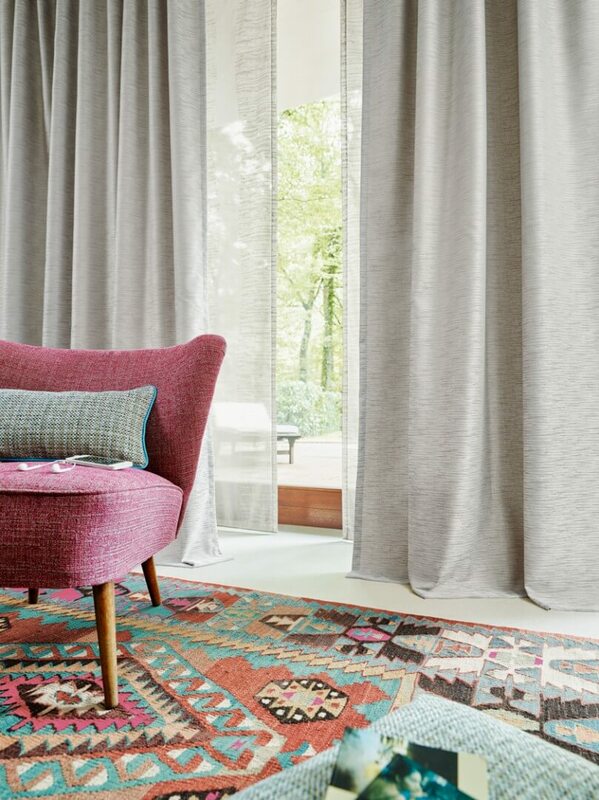 In both the public and the private sphere, these fabrics are perfect for combining with others. They are available in 30 colors, including the entire palette used in the PRISMA range. This fine leno weave Trevira CS window decoration with a flamé effect is playfully light-weight and lets in plenty of light – even in the most vibrant of colors. This digital print features watercolor effect dots settling like shimmering soap bubbles on the transparent background. It is available in three different color combinations, including gentle natural tones, muted colors with accents of copper and brass as well as a vibrant summery palette. A real all-rounder: This modern single-color transparent fabric with a natural cotton-like finish can be used in countless ways. It is available in 30 nuanced shades, from soft non-colors to powdery pastels such as apricot, mint and blue. 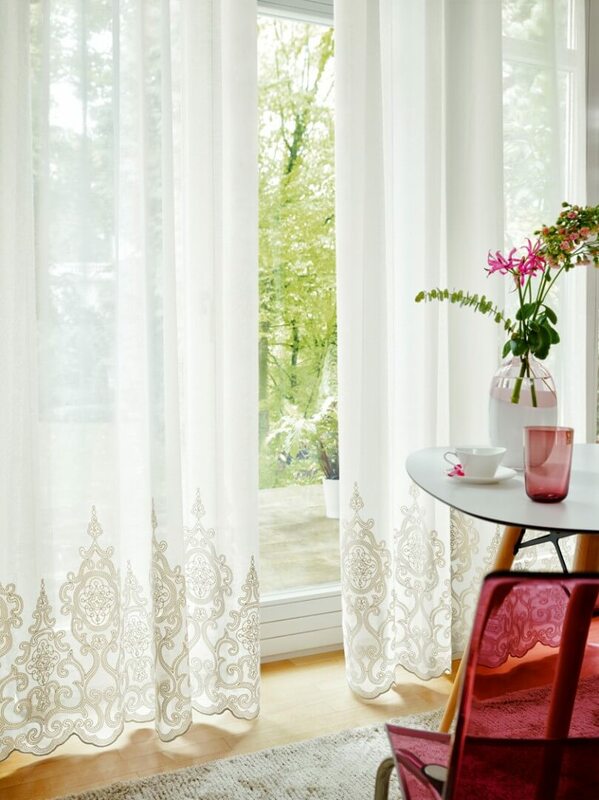 It is irresistibly soft to the touch, making this single-color fabric an indispensable basic for decoration. A modern allover piece featuring bouclé yarn appliqué that adorns the gently flowing base fabric (AURA 3099) with an arabesque pattern. The lively embroidery strikes a fine balance with each of the five delicate color combinations, ranging from white and grey to mocha and mint, which gives this pattern a buoyant feel. 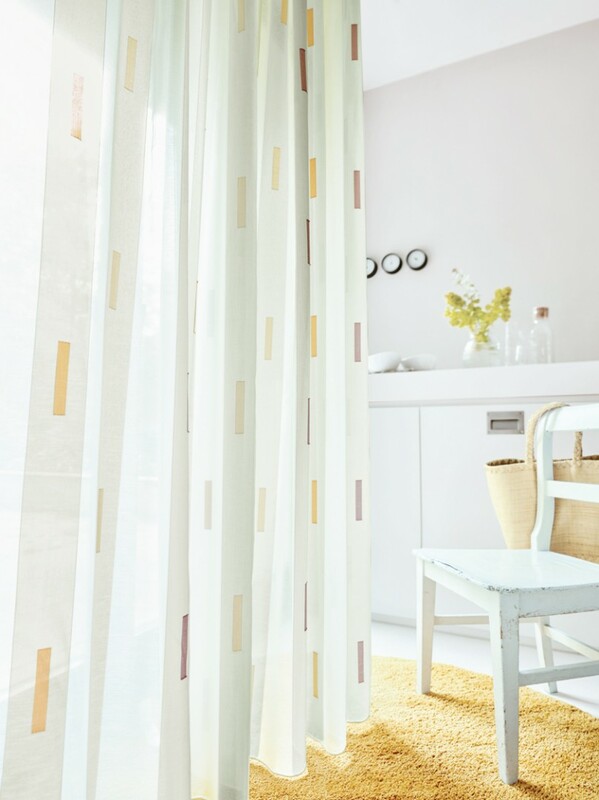 A highly transparent fabric with accent colors in fine lines that cross each other in places, available either in the soft colors of white, sand and brown or in the fresh palette of orange, red and turquoise. 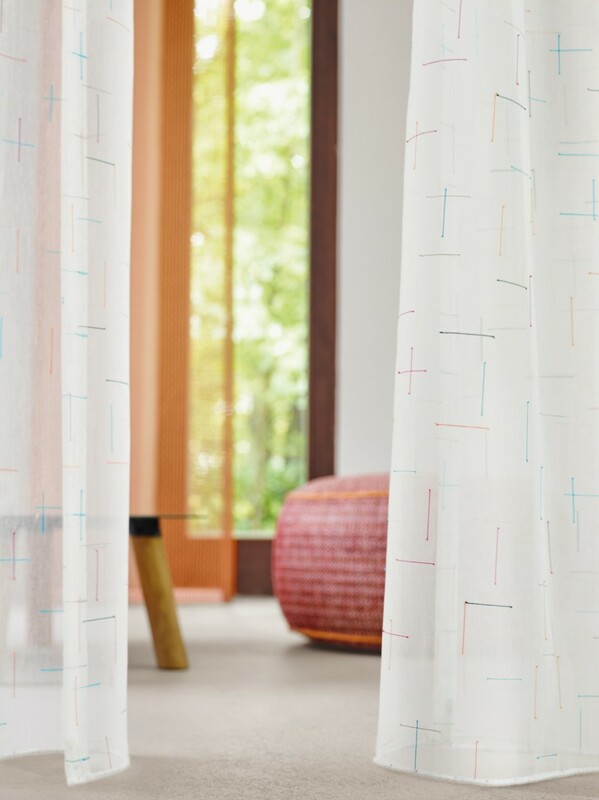 This minimalistic Scherli pattern on a woven base fabric is a modern way of framing your scene, be it a window or elsewhere. Well rounded: This modern base design has a transparent upper section, which allows light to stream through it, while the bottom 39″ features a patterned border that keeps heaters and similar eye-sores neatly out of sight. The lower section is adorned with circles in finely crimped thread that are arranged in a vertical pattern, either white on white or fresh colors on a white background. 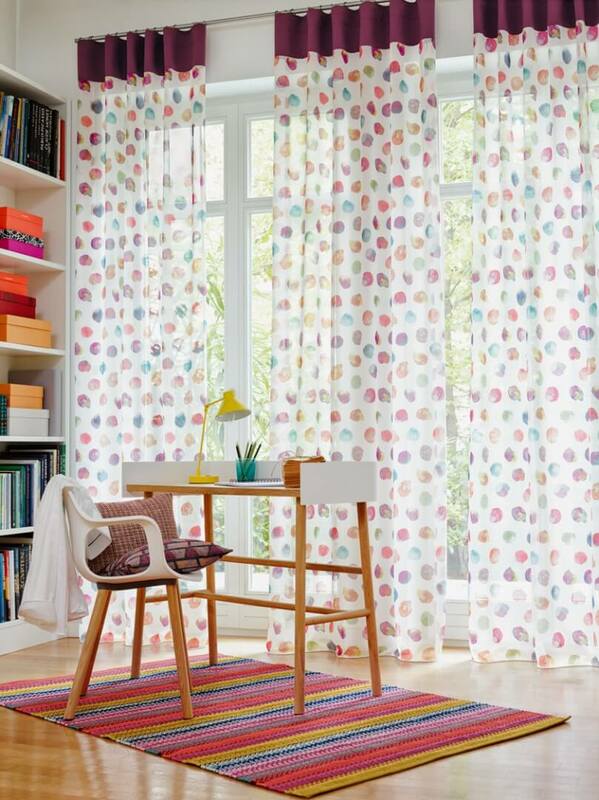 Picture perfect: Expressive print patterns bring the colors and shapes of summer to fabric. They look like they have come straight from the easel! 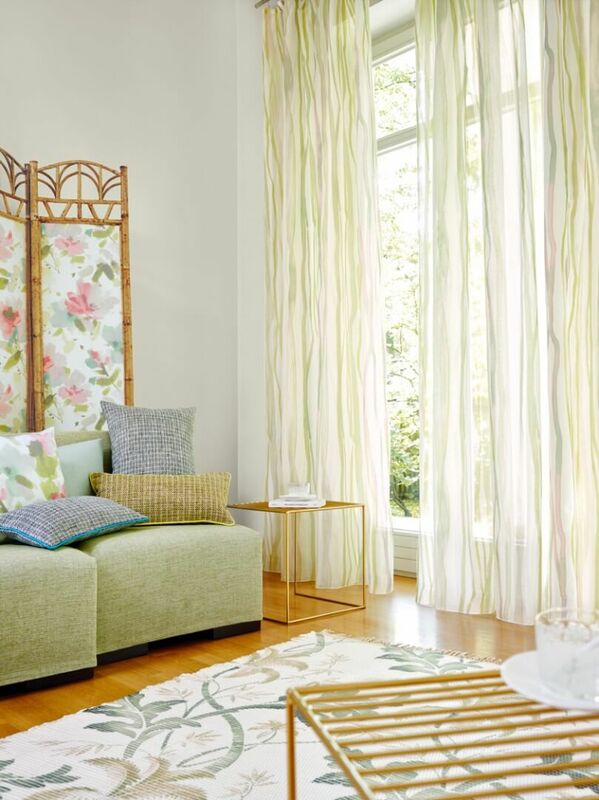 With soft brushstrokes combining to form artistic vertical stripes, this piece is like an impressionist painting on a canvas of gently flowing Panama fabric. Available in six color combinations, from subtle ivory and sand or elegant blue and brown through to vibrant red and orange. Like looking out into a garden in the summer: The softly shimmering satin is adorned with oversized watercolor-style flowers. The color palette is designed to coordinate with AVALON, ranging from pastel shades to vibrant colors. A modern fabric printed with a watercolor effect pattern. The brushstrokes seem to flow down the fabric as they overlap and intermingle with each other. This effect is highlighted even more by the way that this semi-transparent fabric lets in light. Available in six color combinations, ranging from the muted tones of stone and sand to the aqua tones that give this piece its name. A fresh stripe pattern that has been brought to life on a sophisticated double-weave fabric. The result is that the vertical stripes appear to weave their way through the background of extremely fine horizontal threads in five attractive color combinations. A soft crash effect adds a relaxed feel to this inbetween piece. 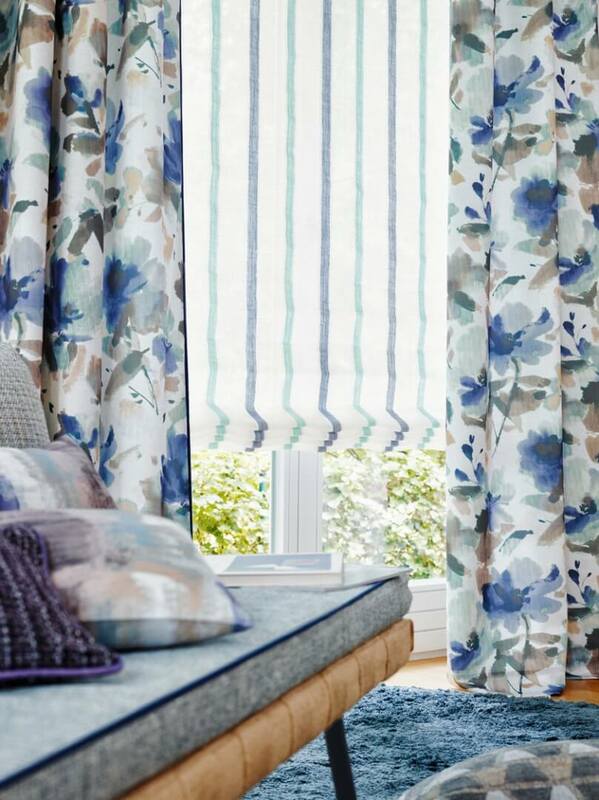 This lively pattern of stripes with differing weights shimmers slightly as it spreads across a background fabric that contains cotton, which makes it naturally dry to the touch. Available in five color variations, ranging from subtle and natural to playful and vibrant. 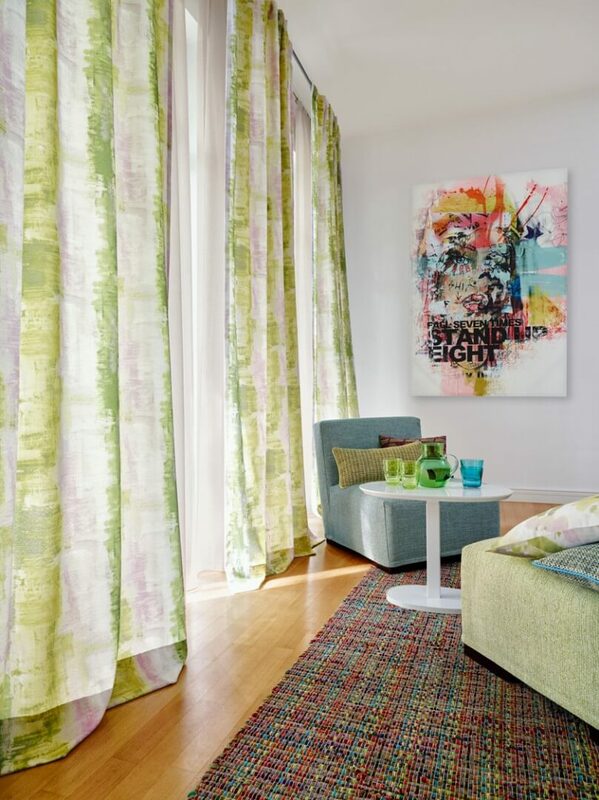 Woven using leno technology, this expressive gauze has a very wide range of uses. The two-tone twisted weft yarn used in this piece adds a sophisticated blend of color to its natural, linen-like look – 15 color variations are available. 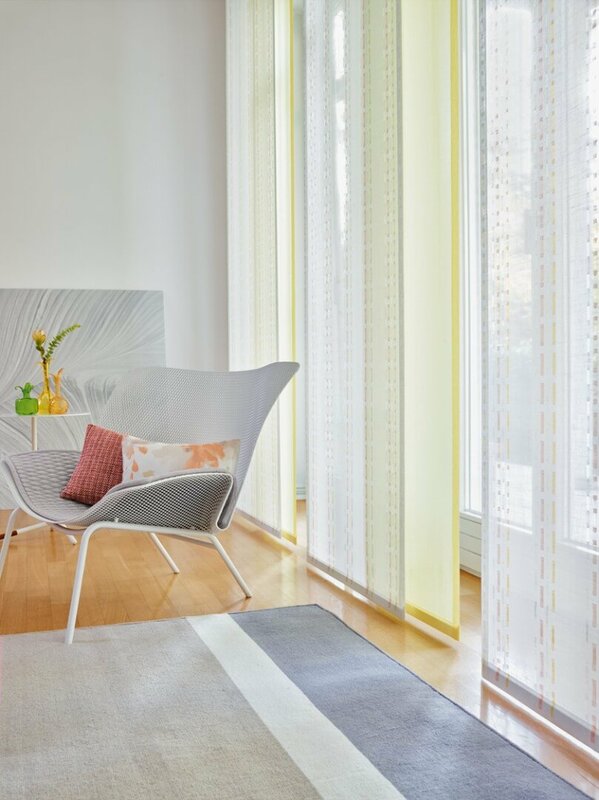 As it is made with Trevira CS, this transparent fabric is fire retardant and suitable for use in private homes and commercial settings. Fabrics with a classic feel, natural color schemes and playful details that combine natural ease with quality craftsmanship. The result is a summery, country cottage style. The linen-like base of this elaborate inbetween creates an appealing contrast with the romantic border embroidery and the playful scalloped hem. This delicate piece, laden with rural nostalgia, is available in three subtle, natural colors. 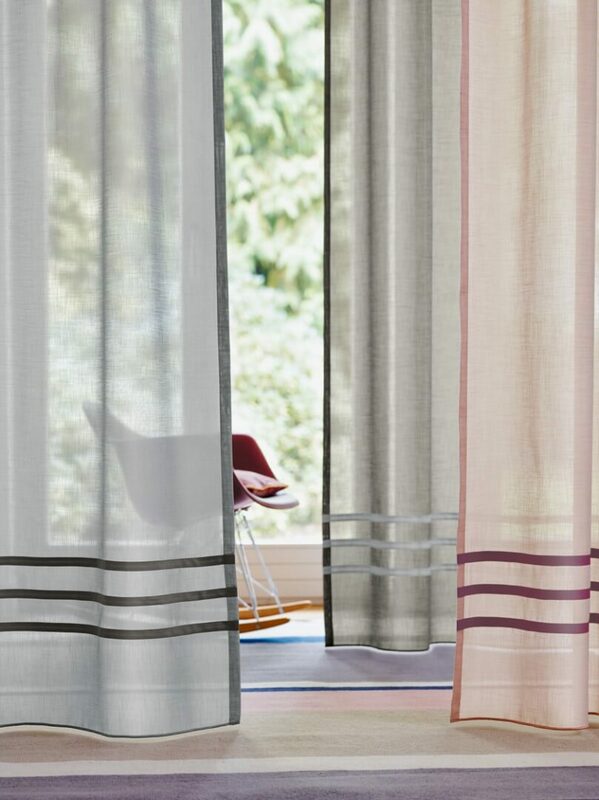 This fabric has a horizontal pattern of ajour-effect stripes in the style of romantic hemstitch embroidery. It is available in five soft non-colors, including white, ivory and sand. 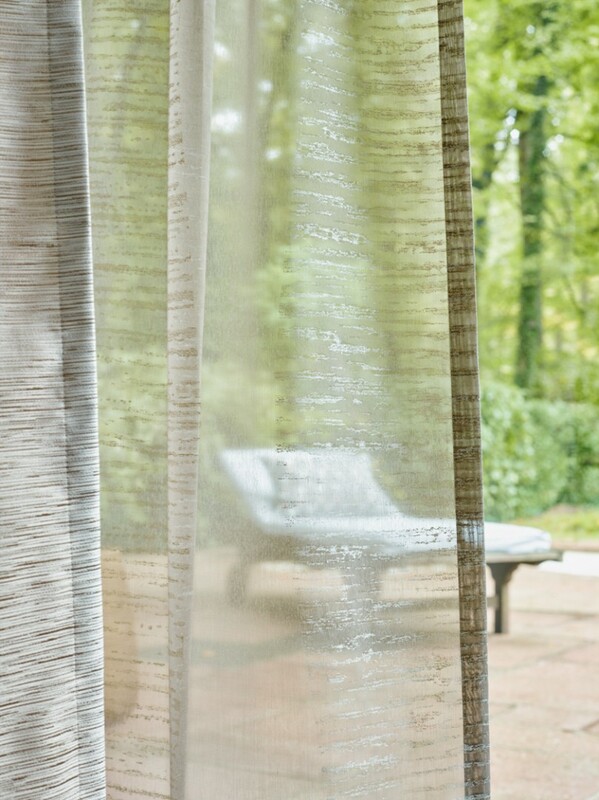 The interplay between pattern and color, linen weave and twill weave refines this transparent fabric by giving it stripes, making it perfect for a country cottage. 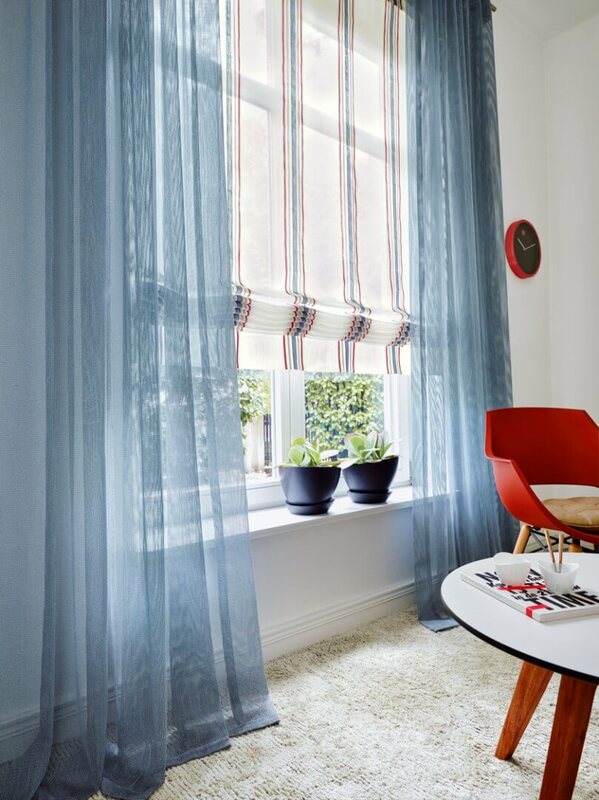 At windows large or small, it creates a natural, homey feel, whether used as an airy decorative fabric or as a roman blind. It is available in five attractive color combinations. 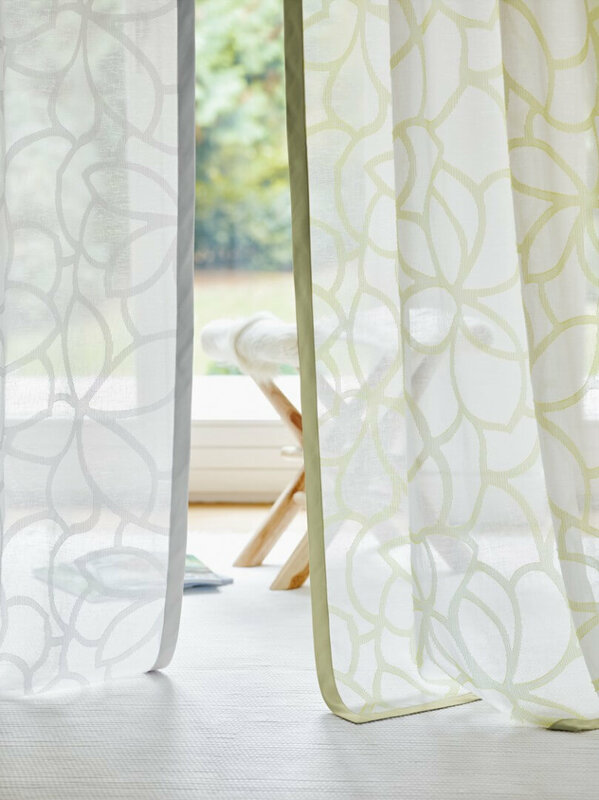 This gently flowing transparent fabric has an allover pattern and makes use of the Scherli technique to depict abstract flowers and leaves, bringing the charm of the rural farm garden into the home. Available in a choice of four hues. Country style through and through. This inbetween, which looks almost hand-woven, features Scherli details arranged to look like lines of stitches. These sophisticated details play with weight and transparency and are available in four attractive color combinations. A transparent background featuring a lavish burn out pattern with spiraling opaque blossoms patterned internally with stripes. Available in a choice of white on white, beige and white, grey and white or green and white. The subtly colored linear forms of these fine graphical degradé stripes shimmer delicately against a matte, semi-transparent background. 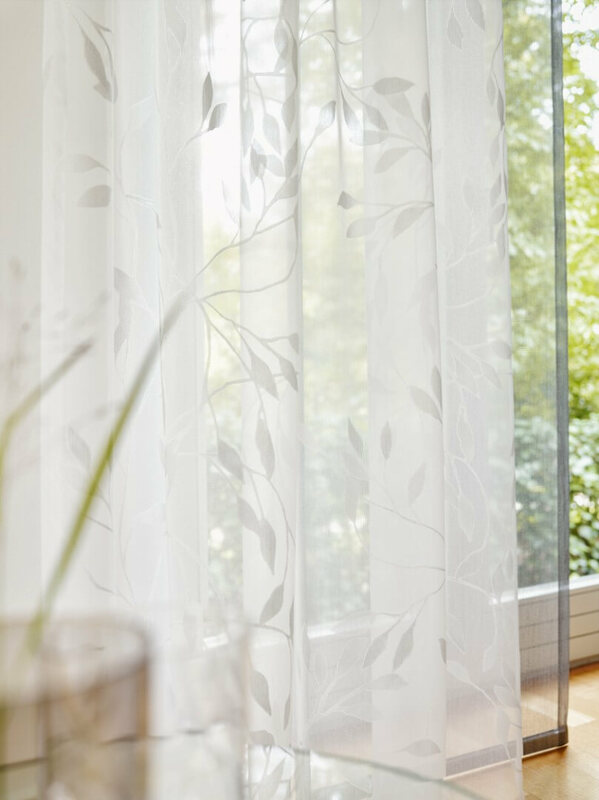 The fabric can be used in a variety of ways and is available in five gentle non-colors, including white, sand and light grey. An attractive variation on the theme of stripes: sections of Scherli in six color tones are arranged at intervals along vertical paths on a two-tone transparent background. The piece is rounded off with delicate accents in chenille. A semi-transparent single-color fabric with a matte surface and a sophisticated yarn structure. Available in 25 colors, COLLIN perfectly harmonizes with the nuances of ADO’s printed fabrics and Jacquard fabrics. Even on its own, the gently flowing drape of this fabric will turn heads. Shimmering surfaces, pearlescent effects and matte-finish structures reflect the city lights and emphasize the elegant, urban style of this environment. 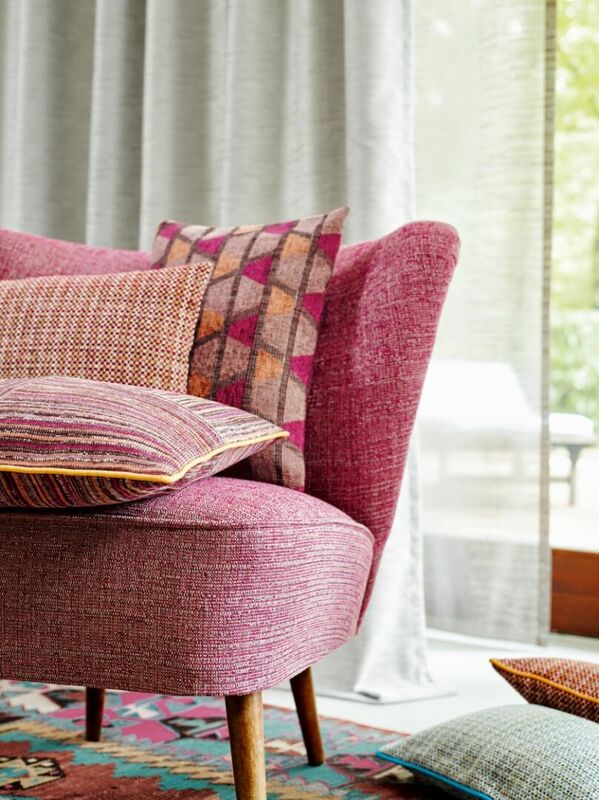 A contemporary interpretation of a herringbone pattern, interspersed with lavish wavy lines. This decorative fabric in Jacquard weave is available in nine color combinations, from delicate pastels on a beige background through to dramatic sand on black – hues that work perfectly with the palette of the BOHEMIA range. An elegant, graphical Jacquard fabric with a matte, woven relief pattern of diamonds that stands out from the soft sheen of the background. The nine available color combinations can be harmoniously combined with ZIG ZAG. This lively fabric plays with transparency and weight, making use of the Scherli technique to create pattern of transparent diamond shapes. DIAMOND has a fine shimmer finish and is available in six subtle colors. This transparent fabric is true to its name – a modern pearl-effect printing method gives it a fine sheen that runs horizontally. Its delicate luster evokes the pearly-white bark of a silver birch tree. Available in four colors. This net fabric will add a touch of fascination and excitement with its large grid pattern. Available in 18 color variations. 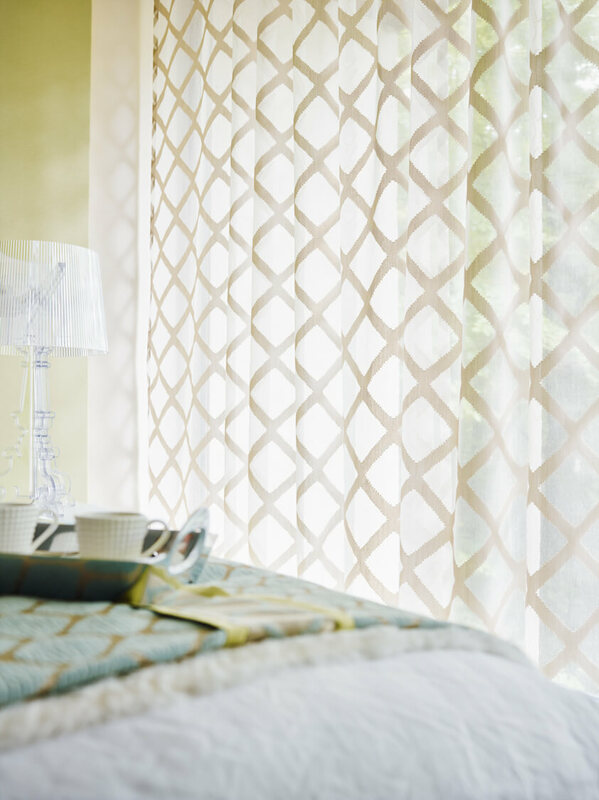 The colors range from elegant tone-on-tone combinations to modern, two-tone versions that have a gingham-like effect, despite being transparent. A fine luster adds an impressive finishing touch. An elegant semi single-color piece with a horizontal Jacquard weave structure. 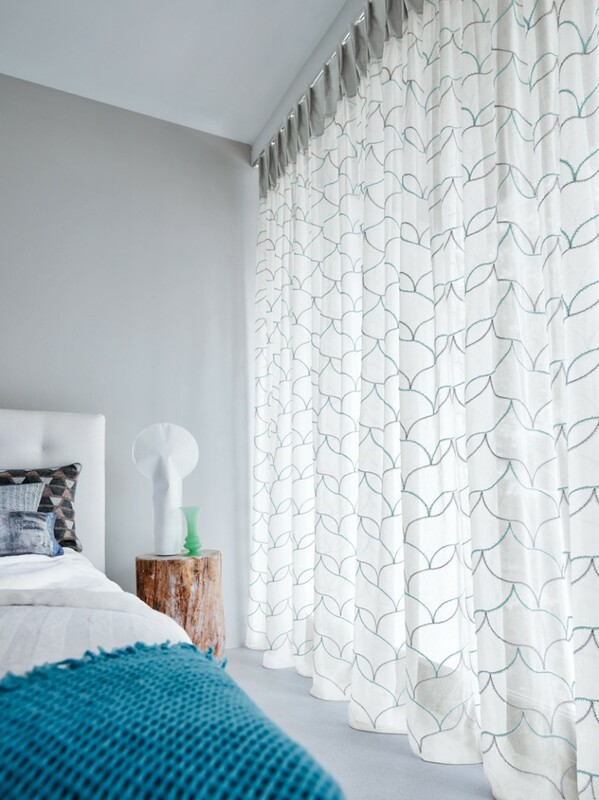 This captivating decorative fabric has a soft drape and a matte finish. Available in 17 color combinations, from delicate non-colors to gentle pastel tones, it will harmonize perfectly in any setting. Modern comfort for sofas, armchairs and other seating furniture. 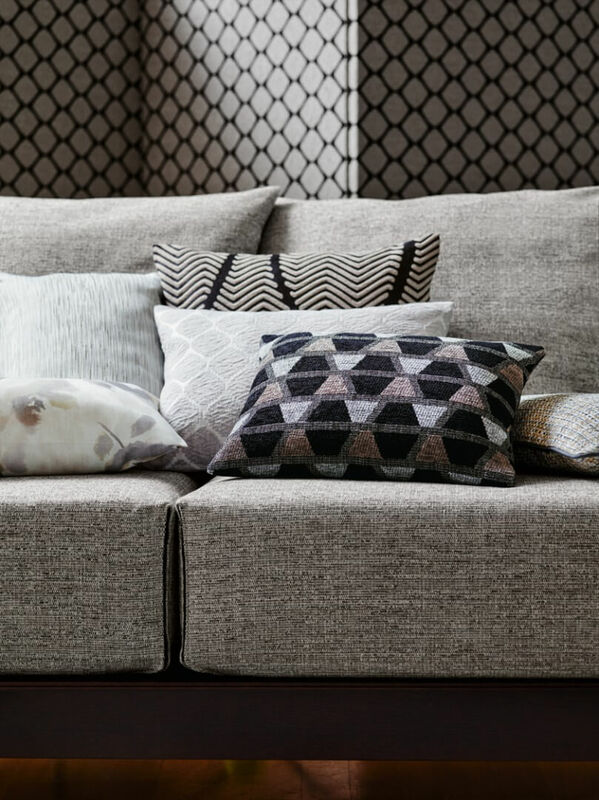 These four upholstery fabrics by ADO, which work just as well combined with each other as they do with the rest of the collection, add the finishing touch of comfort to this range of interior textiles. Single-color fabric with an added extra. 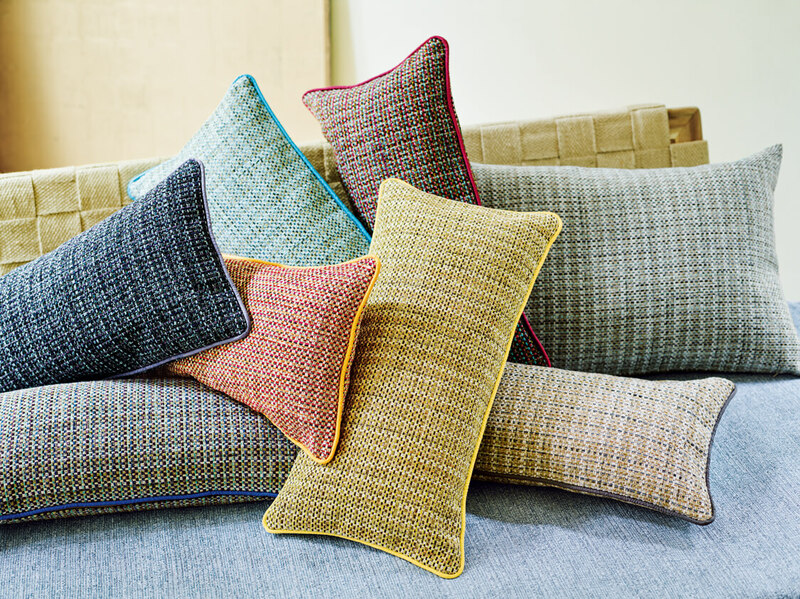 This upholstery fabric has a natural weave appearance, which adds interest to its surface texture. It is available in 20 different colors. The chenille yarn used means it is soft to the touch and comfortable to sit on. Using different colored chenille yarns in the warp and weft gives this fabric a woven look and creates a vibrant interplay of colors. This lively surface appearance is available in twelve different colors, which can each be used individually. The surface is very durable and does not show signs of wear. Diverse upholstery fabric with rhythmical stripes in a relief texture. This fabric gives sofas, arm-chairs and seats an attractive surface texture, available in six different color combinations ranging from subtle to vibrant. 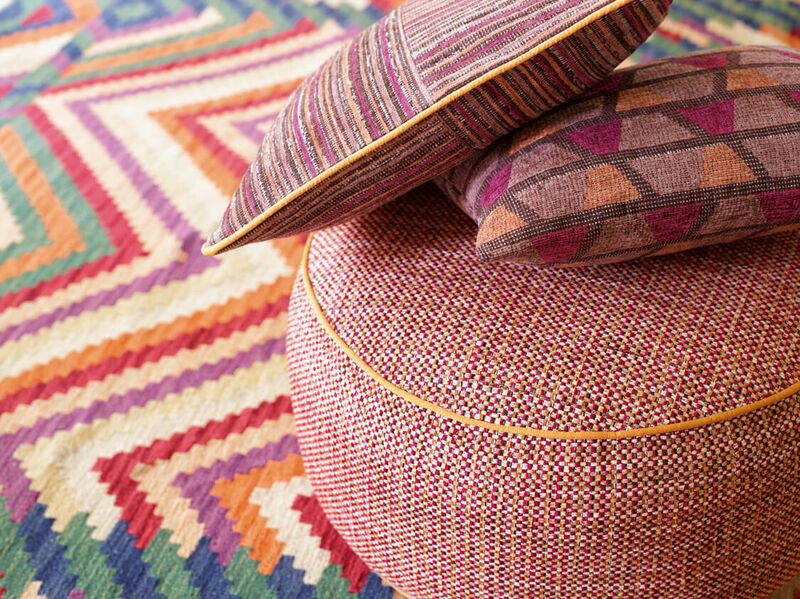 These all harmonize perfectly with the three other upholstery fabrics and can be combined in a mix-and-match fashion. In love with shapes. This Jacquard fabric features rows of chenille effect trapezium shapes in three colors, creating a textile mosaic that is available in six different color combinations. These combinations are fine-tuned to work with the stripes in LIMBO’s palette, although they also look stunning with BELCANTO and SAMOA. Some of the fabrics look like hospital/convalescent home use not for the home consumer. Did like quite a few though and will order samples . Hi Robin, some of these designs are inherently flame retardant (IFR) and therefore suitable for commercial use, but any of these can be used in the home. Hi Lowell, all of these designs are available as hanging samples, and most are represented between two different books under the themes “Painted Garden” and “City Lights”. For sample and fabric pricing, please call our customer relationship manager at 800.845.0918 x1456. Hey I am just curious if these can be shipped nation wide or not. I do not need a professional to install drapes so that won’t be an issue. Although I am curious why the AURA is said to be monotone but the picture features one that is multicoloured. 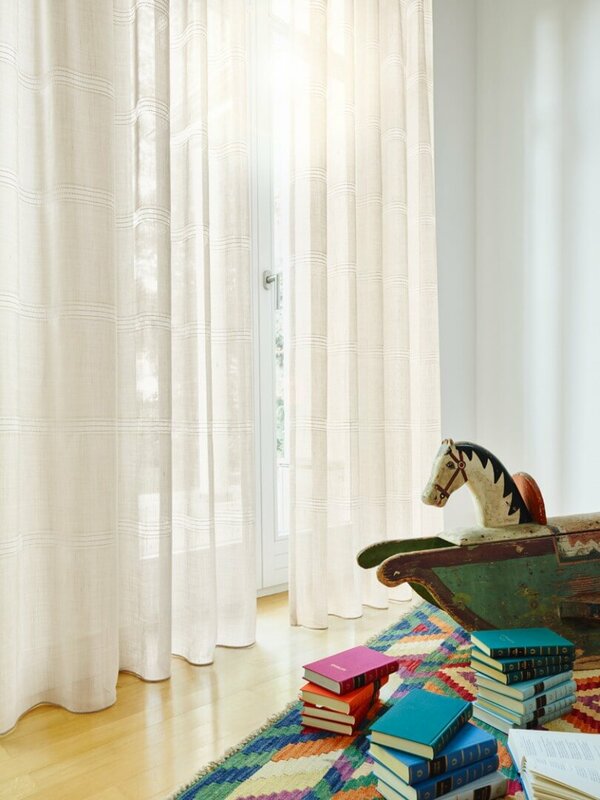 Yes, all of our fabrics and custom window treatments are shipped nationwide. Aura 3099 comes in 30 different colors. The shade in the image utilized four different colors (882, 664, 995, and 795) of that fabric, and a fifth color (443) is represented as a sheer in the foreground. Thank you for your inquiry! We hope to hear from you soon.